I always love Pulao and try different Pulao by changing the veggies. I love the smell of basmati rice cooked in mild spiciness but with great aroma and unbeatable taste. 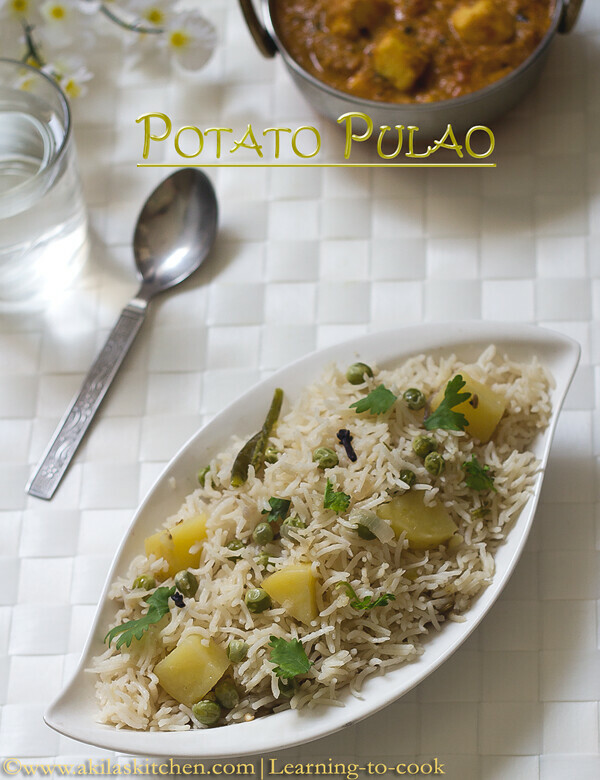 My kid is a potato lover and asked me to try this Potato Pulao. Even my little one ate as this is very mild in spiciness. 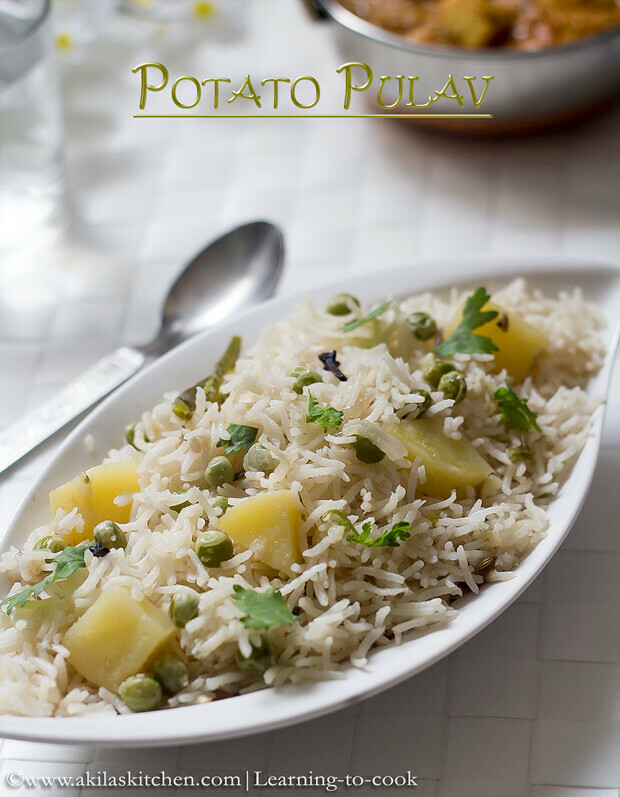 You can try different pulao recipes from here and some I have given below. 1. Wash and Soak rice for 20 mts. While the rice is soaking, you can start preparing the following. Wash the potato and green peas and keep it ready. In a Pressure cooker, add oil and all the spices mentioned above. 2. Add the onion and ginger garlic paste and fry till golden brown. Add in the green chillies too. Add coriander leaves and salt and saute well. (At this stage you can add the mint leaves too). 3. Add the potato now and saute for 5 to 7 min(Do not skip this). This is done, so that, it gets cooked perfectly. Add in the peas and fry for a min. 4. Add the water and when it starts boiling, add the rice. 5. Close the lid and simmer for 10 mts. (cook in low flame) After 10 min, switch off the stove and when the pressure goes off, remove the weight and mix the pulao gently taking care not to break the rice. Add the ghee at this stage and close the cooker lid for 3 min. 6. 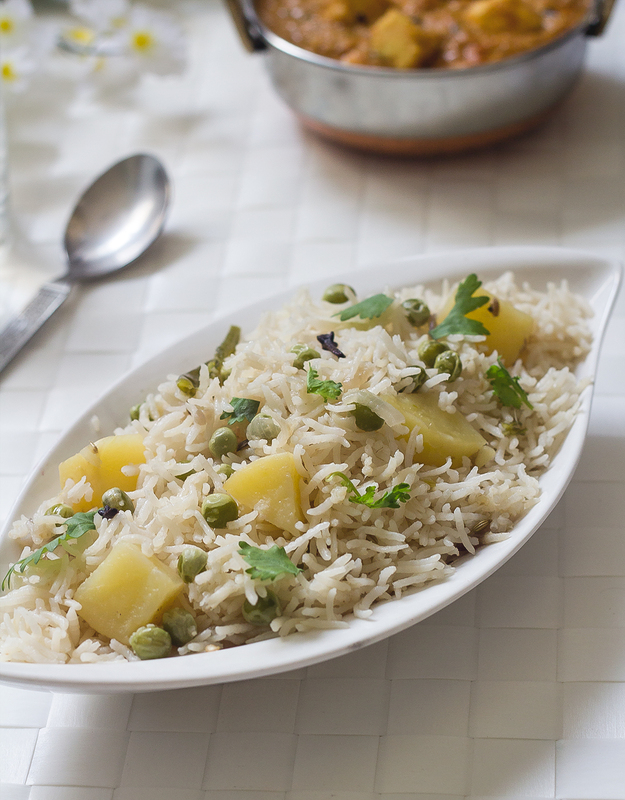 Garnish with coriander leaves and serve the hot Potato Pulao with Paneer Butter Masala. 1. Always saute the potato for 5 min, before cooking, so that the potato will be cooked nicely. This is done, as we are not going to cook the rice in high flame. 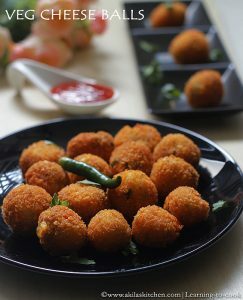 Sounds very simple and tasty! Basically rice makes me happy and so is this pulao. The rice turned out so good.